Comment: Pages are clean! Maybe you can see minimal sign or signs! The Best Price! Ships direct from Amazon! A nice collection of vignettes on success, planning, attitude and approach by over two dozen business and civic leaders. Reading the book provides inspiration, motivation and practical techniques for achieving balanced success in life and business. Some of the vignettes are poignient while others are somewhat blase. However, taken as a whole, the book provides a nice collection of thought provoking reads, and can be sat down and read through like a book, or used for some daily inspiration one story at a time. I really enjoyed reading the stories of people that are not so different than me and the people that I meet each day. The only difference is that the people in these success stories capitalized on their strengths and looked for ways to help others achieve success in life and in business. 5.0 out of 5 starsHere are 65 enlightening perspectives on "success"
The subtitle of this book refers to "techniques for achieving success" but in my opinion, everything depends on having a mindset for success. This is what Henry Ford meant when observing "Whether you think you can or think you can't, you're right." Only with the right mindset will a person be motivated to identify and then master the skills and then techniques that success (however defined) can be achieved. Ivan Misner and Don Morgan have collaborated on several volumes (including this one), selecting and then assembling material from a remarkably diverse range of sources, including themselves. For example, among the 65 articles, Misner is the author of "The Fundamentals of Success"; Morgan is the author of "Subconscious and SMART Conscious Goals" and "Goal-Setting Process (GSP). "They also co-authored the Preface and a brief introduction to each of the eight chapters. There are several different ways to read this book, including cover to cover. My guess (only a guess) is that most readers will check out the Contents and then cherry-pick those articles whose author and/or title catches their eye. A word of caution: with all due respect to eminences such as Brian Tracy, Anthony Robbins, Tom Hopkins, Wayne Dyer, Mark Victor Hansen and Robert Allen, and Michael Gerber, some of the most valuable material is provided by those who are generally unfamiliar. Case in point: Peter Schutz, former head of Porsche, who shares his thoughts about "a culture of success." He differentiates success from excellence, noting that success "must come quickly and may be fleeting and fickle" whereas excellence is "lasting and dependable," adding that "an obsession for success can burn up the manager who seeks it. Excellence will build the manager who strives for it." Credit Misner and Morgan with selecting 65 articles that offer diverse and thought-provoking perspectives on how to achieve "success in business and life." At this point, I presume to include one thought of my own. First, a great deal has been said and written about the importance of "balance." Is it possible to be a devoted spouse and parent and still have a success business career? For whatever reasons, many men and women have found that very difficult to fulfill all of their obligations in both areas. I have become convinced that a person cannot balance everything but it is possible to balance what is most important, and be willing to accept compromises, adjustments, trade-offs, etc. with regard to everything else. It remains for each of us to decide what is most important, both in business and in life, and then maintain a proper balance of these priorities. Directly or at least indirectly, all of those who contributed material to this volume can help readers to develop the right mindset so that they can make that determination, and then maintain that balance. 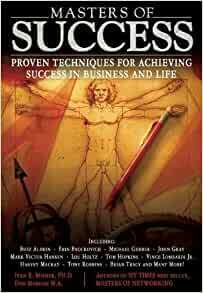 Those who share my high regard for this book are urged to check out other works authored or co-authored by Misner and Morgan well as two books by Tom Butler-Bowdon: 50 Success Classics and 50 Self-Help Classics. If you are looking for practical, how-to this is definitely not the book. But this is the book if you are looking for sparks of inspiration, a wide collection of what success can mean, and interesting tidbits across careers, walks of life, and demographics. The bite-sized length of each story make this book a fun and breezy read. For Michael Gerber fans: check out Michael Gerber's spot-on closing remarks about success. That alone makes this book worth reading. Reading the book gives one hope that success is not just a wish or dream, that it can be real. Success means different things to different people and the book captured this message. In our society, more often than not, success is measured only by the $ sign. This book gives us a more meaningful explanation of what success is all about. Success comes from unexpected areas of life and the book has lots of examples illustrating this. I will read this book over and ever and as I grow I will be able to gain a new perspective every time. What a great read! Easy to sit down and read many stories at a time, in a variety of areas from personal growth to business. The best part is the combined effort of MANY business professionals, sharing success stories that everyone can easily understand and actually apply these lessons to their own life and business.